The Friends of the Maple River is a citizens group organized to help promote and foster the wise use of the Maple River and it's watershed. This award is presented to individuals, groups and business that have demonstrated high regard for the watershed and its quality of life. Nominations are made by members and approved by the group in open meetings. Presentations are made at public gatherings or at FOTMR meetings. 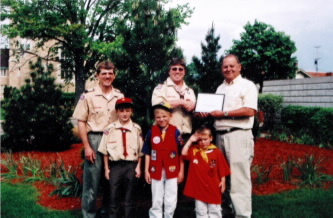 May 2006 Cub Scout Cub Scout Pack 572 in St. Johns received a FOTMR Award for their work in picking up trash and refuse from the public parking areas on state land along the Maple River. The Cub Scouts received their award from Joe Latoff, FOTMR Past President. 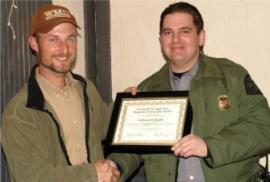 January 2009 Rich Nichols, Clinton County Conservation Officer, and Art Bloomer, resident, both received FOTMR Awards for their work on an illegal trash dumping complaint at Muskrat Lake. Rich & Art received their awards from Jeff Wadell, FOTMR President. 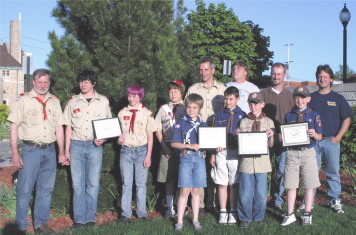 May 2009 Pack 572, Troop 72, and Pack 520 Scouts received a FOTMR Award for their work in putting up, cleaning, and maintaining wood duck houses at the Maple River State Game Area. They received their awards from Jeff Wadell, FOTMR President. 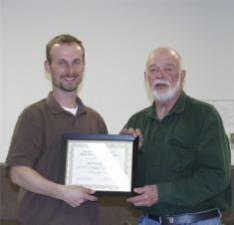 July 2009 Ducks Unlimited received a FOTMR Award for the work they have done in the Maple River Watershed. Heather Shaw from Ducks Unlimited accepted the award from Jeff Wadell, FOTMR President.